The FERC Scoping Meeting for Access Northeast will be May 19, 2016 at 6:30pm at Abigail Adams Middle School. The official notice can be seen by clicking here. Below are the statistics included in the letter about how many children reside/attend school within a 3 mile radius of the proposed Weymouth site. There are 33 private and public schools within a 3 mile radius of the Weymouth site. There are also 38 privately owned daycares and preschools not included in the student counts below within 3 miles of the proposed station. So in total, 71 schools/preschools/daycare are within a 3 mile radius with the Weymouth location. Even the schools within the radius of the existing compressor stations on the Algonquin line are a significant distance away from the sites. The data on the effects of a compressor station on children and adults is not there because they are typically sited in rural communities. Here is a recent article where the chemicals that are documented from the pipeline companies which are released at compressor station sites are matched up by scientific studies of these pollutants and human health. CLICK HERE for the article from New Hampshire. The Massachusetts Energy Facilities Siting Board will be hosting a meeting on Access Northeast on May 11, 2016. Last night, the Weymouth Conservation Commission continued the public hearing for Spectra's proposed compressor station in North Weymouth. This meeting and public hearing is about the Wetlands Protection Act which the commission governs in town. The article which summarizes the almost 4 hour long meeting CAN BE VIEWED HERE. You can watch the meeting on WETC by Clicking HERE and going to Playlist, Other Government. April 6, 2016 was the meeting. The Boston Globe covered our compressor station proposal today. Monday night was the MassDEP public hearing for the Chapter 91 Waterways License for the Atlantic Bridge Project from Spectra Energy. The meeting lasted just over 4 hours and numerous residents from Weymouth, Quincy, Hingham and Braintree spoke out against the issuing of a waterways license from MassDEP. Not a single person stood up and spoke in favor of the project. Please note that the written public comment deadline has been extended to April 19, 2016. MassDEP stated that they were considered ancillary dependent on the waterfront - which makes no sense since every other compressor station on the Algonquin pipeline is landlocked. Additionally, 4 of the alternate sites for the compressor are also landlocked. If you read the MassDEP's frequently asked questions (HERE), you will see that a compressor station should not be considered water dependent by any means. What is the difference between water-dependent and nonwater-dependent uses? A water-dependent use is one that requires direct access to the water to occur. Examples include boat landings, piers, wharves, boathouses, docks, revetments, floats and seawalls. A nonwater-dependent use does not require water for the structure or use to exist. For instance, restaurants, residences, parking lots, gas stations, hotels and commercial/retail outlets do not need to be located on the water. Why is my application classified as "nonwater-dependent?" If any part of a project or use site, no matter how small, is considered nonwater-dependent then the entire site is considered nonwater-dependent. For example, if a single family home located on the water has a small dock, which would generally be considered water-dependent, then the entire property is considered nonwater-dependent. Please consider making a public written comment. It's very easy to email these days and free. Please feel free to reach out if you have any questions. combined impact of the two projects, which no government regulator has yet to do. 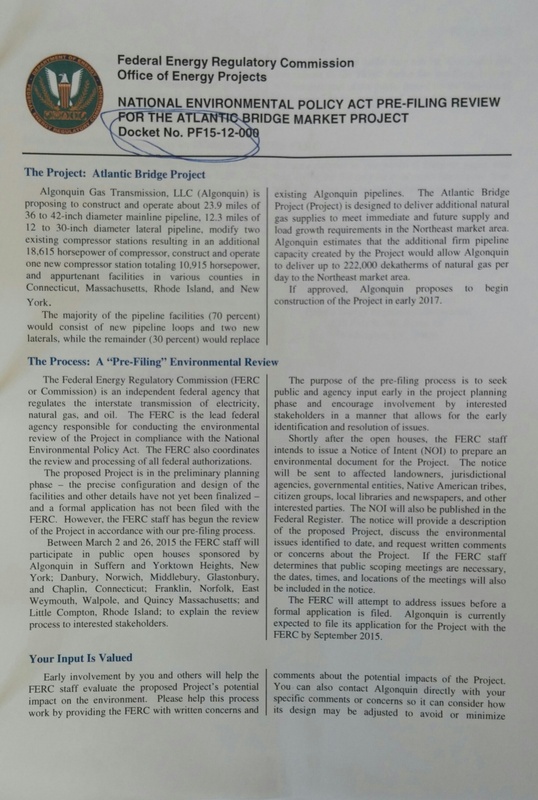 My comments to FERC on January 27,2016 for both Atlantic Bridge & Access Northeast Project can be found HERE. The Draft Resource Reports 1 & 10 for Access Northeast are here. The below 13 documents are the main documents that Spectra/Algonquin has referenced in their letter with the Notice of Application which was released on 11/6/2015 and hit mailboxes on 11/9/15. As you can see the documents they reference for you to look through on the FERC website are extremely long. So I broke them up by report # with their designated title attached – which is not the case on the FERC website – and uploaded them to my server so you don’t have to download these extremely large files on your computer unless you want to. I tried to set it up in this way so you can read the documents about the topics that are important to you. If you see anything you think should be questioned or have concerns about, please email me them and try your best to reference the section number (i.e. 5.2.9) or Table number so it’s easy for me to find as well. Thanks in advance for any input or opinion you can share on these documents. 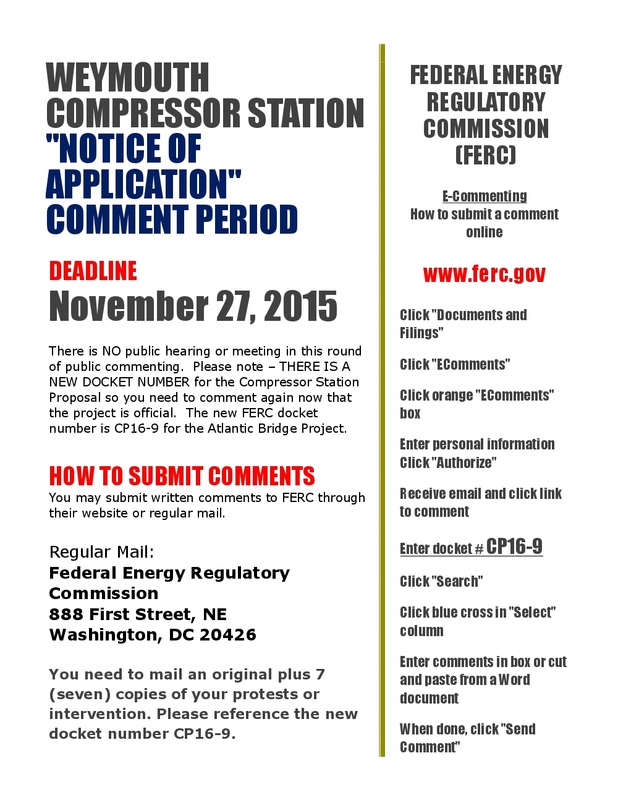 Per the Notice of Application dated 11/6/2015, FERC strongly encourages electronic filings of comments and protests through 11/27/2015. FERC tells you to “e-file” – this will require you to create a username and password. This is a fairly complicated system if you aren’t used to it. You can try to utilize the “eComment” feature which is more simple and does not require you to do many other steps to get your point across. 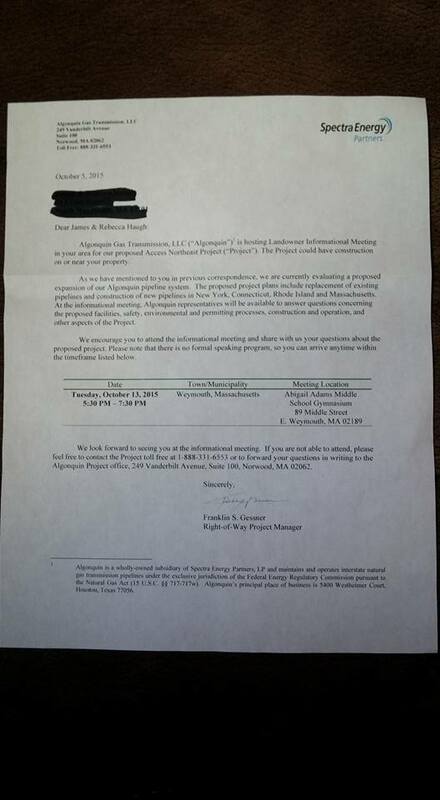 11/10/2015 – Below is the most recent mailing that “landowners” have received from Spectra Energy regarding the Atlantic Bridge Project (building a compressor station). I’ll be making up a flyer about how to e-file here soon. 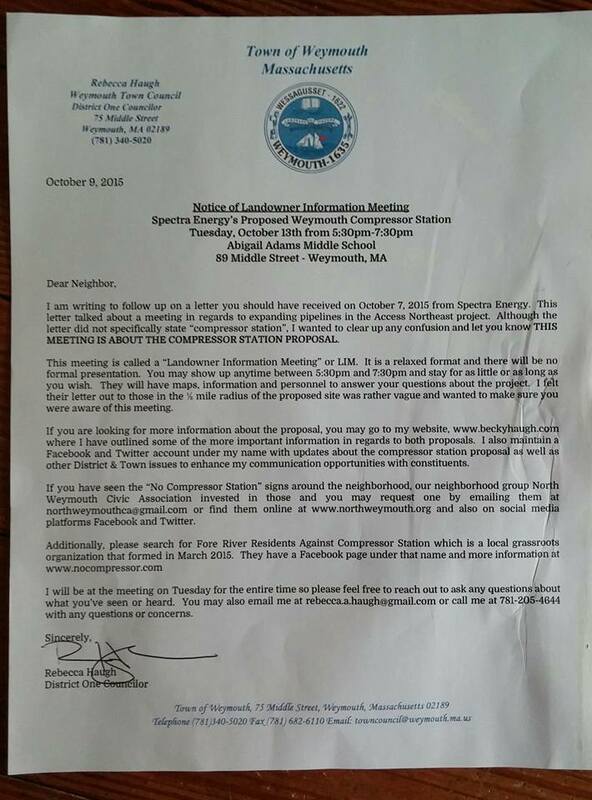 10/20/2015 – Dracut MA is also currently facing a new compressor station by Kinder Morgan. The original preferred site was 27 acres and the station will be 23,000 hp. Kinder Morgan made a decision yesterday to move the preferred site to a more rural area due to public advocacy efforts – because 27 acres in the middle of a residential area wasn’t rural enough. When all is said and done, the proposed Weymouth compressor will be of a similar size of Dracut’s, yet only on 4.3 acres of land with almost 1,000 households within a 1/2 mile radius. The health and welfare of Weymouth residents needs to be top priority over profits and if Spectra and FERC allow the North Weymouth siting of this compressor station, it shows what little regard this company and our federal government’s regulatory board has for our town. Kinder Morgan who is trying to expand their gas pipeline system in the northern part of Massachusetts states that the average compressor station sits on 25-30 acres of land. The North Weymouth parcel where Spectra wants to locate a compressor station is only 4.3 acres and does not boarder open space like many do. How does this not raise any eyebrows to anyone making these ultimate decisions? 10/16/2015 – Continued “thanks” to colleagues on the Town Council for their continued, ongoing support of fighting the siting of a compressor station in North Weymouth. The devil is in the details of how Spectra is wording their claims. Saying things like “The Atlantic Bridge Project is not designed to export LNG from the US or Canada”, yet Spectra has no control of what the companies are doing with the product (gas) after it is sold to them. Nor does Spectra have any control of the price of what we, the consumers will be paying for gas or electricity. They also say that Canada is getting very little gas from the Atlantic Bridge Project yet 3 out of the 7 purchasers of the gas are Canadian companies, 2 of which have LNG conversion facilities. Only 1 of the 7 companies who wants to purchase gas from Atlantic Bridge does business in Massachusetts. Why should Weymouth bear the brunt of Spectra’s expansion with little to no benefit to the Town and residents nearby so big companies can turn a profit? 10/15/15 – If you have been following the pipeline expansion issues in West Roxbury and Dedham, please note they are about 18 months ahead of us in the project timeline. Their expansion is part of Spectra’s Algonquin Incremental Market (AIM) project. 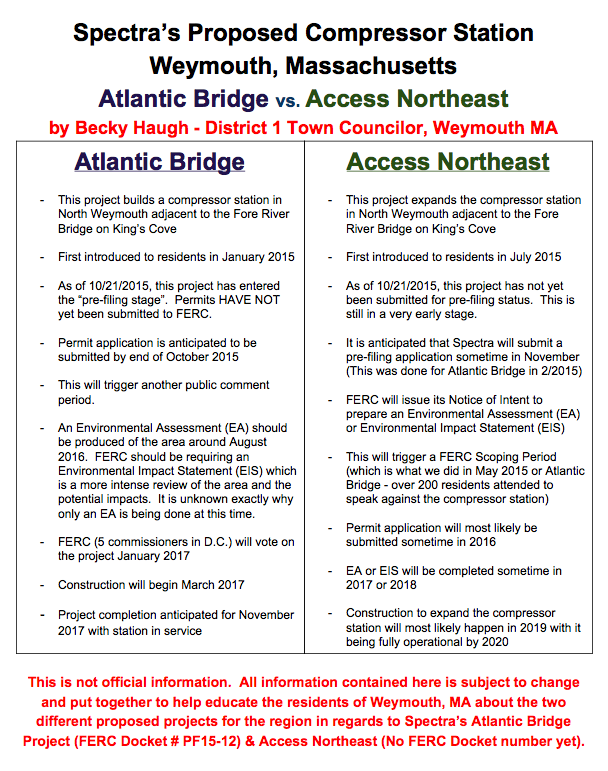 The two Spectra projects that directly impact Weymouth are the Atlantic Bridge project and Access Northeast project. 10/14/15- Thanks to all who went out to Spectra’s information meeting last night. Big thanks to residents Kelly, Stacy, Toni, Cathy, another Cathy, Am, Kim, Sandra, NWCA and FRRACs who all offered and helped to distribute flyers this past weekend to help get the word spread. Next informational meeting like last night will be October 21st at Snug Harbor School at 333 Palmer St In Quincy from 5:30-7:30pm if you missed ours. Scoping periods will most like set to open soon for the Atlantic Bridge Project as they are expected to file their permit application this week and will open for Access Northeast as they will be submitting their application for a pre-filing status. I’ll keep you updated as the process continues or until Spectra and FERC come to their senses and pick a less densely populated area to site a compressor station. Thanks for all the ongoing support and attention to this matter. If you are willing to take 20-30 copies to drop on doors let me know by commenting or sending me a message with what street you can do and I’ll drop off a small stack to you. Trying to get the information out there for those who may not be on social media/online as much. 10/9/15 – If you can’t make the October 13th meeting in Weymouth, you can always stop by the Quincy meeting on October 21st from 5:30-7:30pm at Snug Harbor School. Councilors Croall and LaForest in Quincy have been right there from the start of these proposals in the beginning of this year. 10/8/15 – Please note that the letter that should have hit your mailboxes yesterday if you live within 1/2 mile of the compressor station proposal does not specifically say this meeting is about the compressor station and doesn’t even mention the term “compressor station”. It was brought to my attention today that some people had no idea this relates to it. THIS MEETING IS ABOUT THE COMPRESSOR STATION and I can see how people can misunderstand the meeting’s purpose. Please reach out if you have any questions. 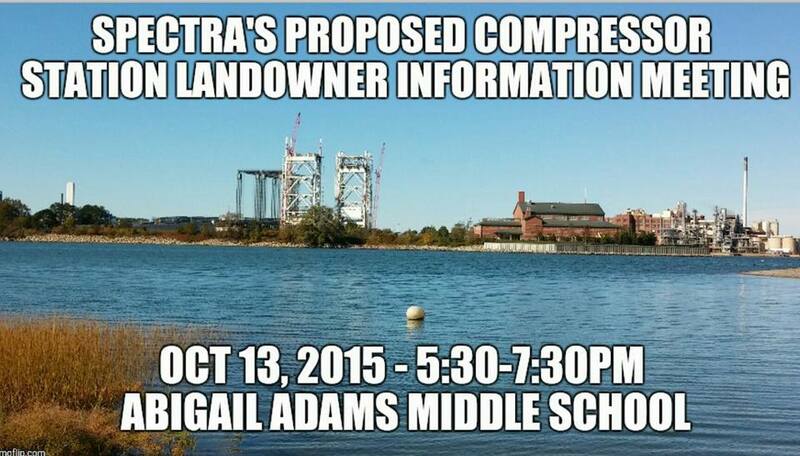 10/6/15- Spectra is expected to file the permit application for the compressor station next week and there will also be a meeting regarding the expansion of said compressor station most likely on 10/13 from 5:30pm to 7:30pm at AAMS (details subject to change due to not receiving official notice of meeting from Spectra yet). FERC moderated the meeting, which included a review of project updates, an update on the status of agency/stakeholder consultation, Algonquin’s plans for filing the FERC application, and agency questions.  -Algonquin is working to complete their application and incorporate information that is responsive to the comments on the draft Resource Reports. Algonquin anticipates filing the FERC application by October 15, 2015 at the latest, which is up to two weeks later than previously planned. – Massachusetts Coastal Zone Management permit will be submitted at the same time as the FERC application. – Chapter 91 Waterway permit will be submitted in early 2016. FERC asked Algonquin to file an updated permit table throughout the application review process, as any application or consultation process statuses change. – Algonquin met with the Weymouth Town Council on September 21, 2015 and provided Atlantic Bridge and Access Northeast project updates. Algonquin needs to connect into the I-10 system pipeline. Algonquin will include a discussion of alternative compressor station locations (outside of Weymouth) as part of the alternative section of their application, including any need for additional pipeline to connect an alternative compressor station to the I-10 system pipeline. comment period, and give landowners who were unable to comment during the first scoping period an opportunity to do so. The supplementat NOI will be mailed to the entire mailing list. cooperating agency they should contact FERC as soon as possible.  This is the last bi-weekly call for the project. Once the application is filed ex parte rules will apply for discussions with agencies that are not cooperating agencies. 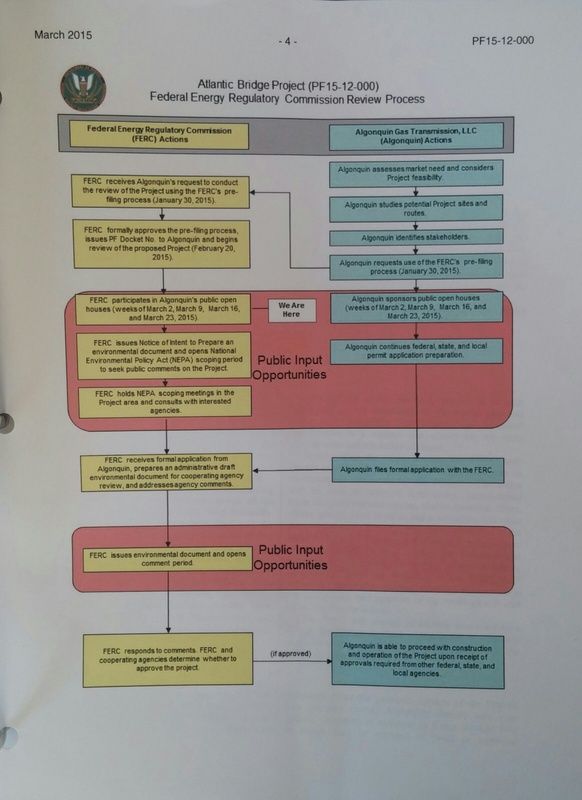 The FERC reminded agencies that the FERC does not issue draft EAs for public comment. The EA will be issued for public comment and then comments will be addressed in the Order.  Barbara Shapiro with the MEFSB asked how long it will take FERC to complete the EA once the application is filed. which will provide a schedule for completing the EA. Tim Sullivan with the USFWS asked about the results of bat and New England cottontail surveys. additional details regarding the proposed mitigation in its application to the FERC. – Algonquin indicated that based on their consultation with Tony Turat USFWS, surveys were not required for New England Cottontail. – Tim Sullivan requested that Algonquin coordinate with his office aswell as Tony Tur. 9/16/2015 – On July 30th, after being denied my request to FERC and Spectra to obtain the addresses of those they notify within a half mile radius of the proposed compressor station, I filed a Freedom of Information Act request. As the elected official who represents North Weymouth, I would like to know the parameters being used to notify residents of the compressor station. Although people’s addresses and names are easily searchable through means like the town’s property viewer and whitepages.com, my FOIA request was denied yesterday with the exception of commercial properties. The furthest commercial property in Weymouth which should be getting notified about the compressor station is 391 Bridge St. I have been asked numerous times why some people get notices about the Atlantic Bridge and Access Northeast projects and others don’t. You have to live within 1/2 mile of the site to receive these notifications by mail. I am obviously not a computer graphic artist, but if you live within this black circle, you should be getting notices. This is obviously not an accurate representation of those who should be getting notified but the best I could do with the information given to me. If you haven’t and believe you should, please contact myself or Fore River Residents Against Compressor Station and we’ll look into it for you. There are 751 households in Weymouth within this 1/2 mile radius and 213 households on the Quincy side. 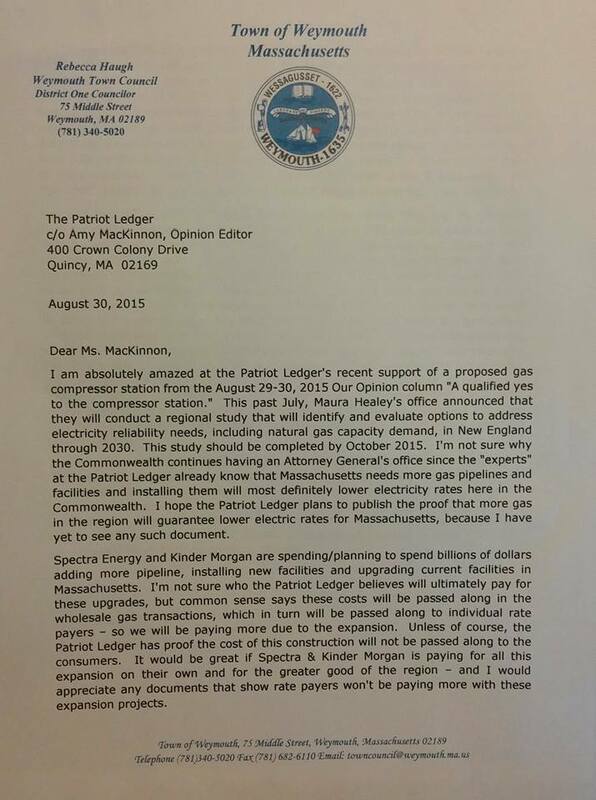 9/5/2015 – REBECCA HAUGH: Ledger’s editorial on Weymouth compressor off base in response to the Patriot Ledger’s endorsement of the compressor station on 8/28/2015. 7/24/2015 – The Access Northeast Project introduction letters hit mailboxes yesterday. You can click the below link to read it. It’s 12 pages long including maps and a FAQ section. Please note that the affected landowner radius (people who own houses within a 1/2 mile of the proposed site) shifted from the previous mailings. It is possible this is the first time you are receiving correspondence or you may have received correspondence about the proposed compressor station in the past but did not receive this one. I’m trying to make everything mailed to affected residents available electronically here so neighbors can be informed one way or another. 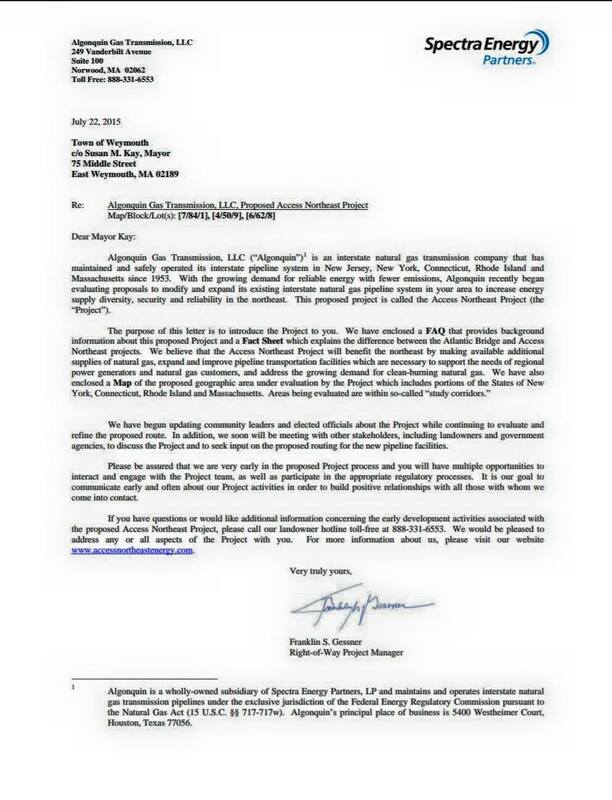 7/23/2015 – Compressor Station Update: The attached letter should be hitting your mailboxes today or tomorrow if you live within 1/2 mile of the proposed compressor station site. This is a project introduction letter (new project name is Access Northeast) to inform you that Spectra has plans to expand the compressor station which isn’t even permitted/approved yet (Original project of building a small compressor station is Atlantic Bridge Project). I will try to simplify the facts pertaining to the two projects moving forward as more details emerge about both. As of now, Atlantic Bridge was introduced to residents in January 2015 and the pre-filing application was submitted in February 2015. We had our public hearings in May 2015. 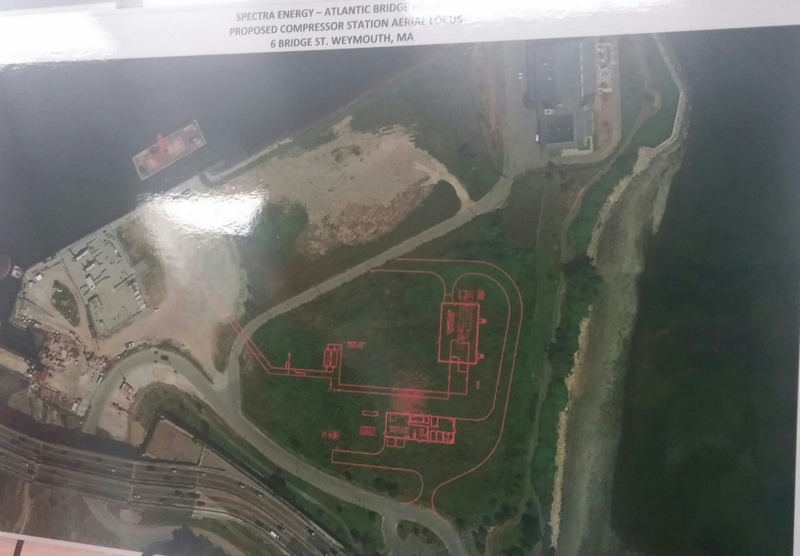 Spectra plans to submit their permits for Atlantic Bridge in September 2015 with construction beginning Spring 2017. As of now, Access Northeast is being introduced to residents now, July 2015 and the pre-filing has not been submitted yet. An open house should be scheduled for this project coming up soon which should provide timelines and more details of this project. 7/10/2015 – The July 2015 Monthly Status report is now available. It is 5 pages long. Please note that it states that on June 30th, I met with Spectra and we discussed 3 alternate sites for the compressor station. All three that were presented are within Weymouth – one by the CVS on Washington St. and the other 2 year Finnell Drive. I believe alternate sites must be presented in areas outside of Weymouth which is 97% built out and in a place that will not affect thousands of residents. At this meeting I was also presented gas line expansion plans for Weymouth and informed that there are plans to increase the Weymouth compressor from 1 turbine to 3 turbines in a new project Spectra is presenting called “Access Northeast”. Click the link below to read the 4 page report. 7/5/2015 – Resource Reports 1-12 are now available at FERC.gov. These are the documents that are referenced for answers to questions and comments that were brought up at the May 13, 2015 Scoping Meeting. Please note that the entire document is 1,364 pages. Because of the size of this document, I am unable to upload it to this page. I was working on reading through it to get the main points about the Weymouth compressor station up here for you. It may take a while. Unfortunately the entire document includes all aspects of the project from NY through MA so one can’t just read the information pertaining to Weymouth and the proposed compressor station. Thank you for your patience. 6/24/2015 – LAWN SIGNS ARE COMING THIS WEEK! Many thanks to theNorth Weymouth Civic Association who fronted the cost for the first batch of lawn signs. Please contact them at northweymouthca@gmail.com if you would like a sign in your yard. They are also asking for any monetary donations you may be able to provide. Each sign is about $5 and they would like to order a couple 100 more. Please click this link if you’d like to donate to the cause. No amount is too small. 6/19/2015: Just wanted to give a big “Thanks” to Dedham Selectman Michael Butler for his activism in trying to stop the construction of a new gas pipeline in Dedham yesterday. Read the story HERE on WCVB Boston. 6/10/2015 – The May Monthly progress report for Spectra’s Atlantic Bridge Project has been uploaded to FERC. You can read the 8 page document at the link below. Besides increasing the horsepower of the proposed Weymouth Compressor Station, there is no significant updates to report about Weymouth’s section of this project. With the Pre-Filing comment period for Docket #PF15-12 coming to a close tomorrow, I’d like to address a few concerns that have since the scoping meeting on May 13, 2015. I received notice from a Spectra Energy representative on Wednesday June 2, 2015 that the proposed Weymouth Compressor Station will be increased from 7,700 hp to 10,900 hp. Due to the fact the Federal Energy Regulatory Commission’s public hearing notice ​​​​for the May 13, 2015 scoping meeting specifically stated that the proposed Weymouth Compressor Station would be 7,700 hp and there is a now a known increase in the size and scope of the project, I respectfully ask that FERC hold another scoping meeting in Weymouth, MA and make Spectra Energy notify the 964 households that are within the ½ mile shareholder radius of the change/increase in plans as we are still in the pre-filing stage. Additionally, I believe that FERC should extend the public commenting period to allow shareholders to be notified of the change in plans and increased horsepower so they can comment accordingly. This is an over 40% increase to the scope of the project that is already known and since elected officials got word of this increase on June 2, there has been no official filings or changes on this submitted to FERC in the past 8 days so shareholders can be properly informed to comment. Additionally, it is already June 10, 2015 and Spectra Energy has not yet filed their monthly progress report which I was informed on June 3, 2015, was “hoping to file with FERC later today as part of our monthly report.” It would have been beneficial for Spectra to be more transparent in this process and release that report prior to the end of FERC’s pre-filing comment period so residents and concerned parties can see any significant changes to the project thus far. Reading through the Environmental Impact Statement of the Algonquin Incremental Project that was published late 2014, I noticed that most of the Noise Sensitive Areas (NSA) that are closest to the existing compressor stations on the Algonquin Line are much further than our NSAs. Because there is noise impact stated in that report from 1/4 mile to almost 3/4 of a mile away at existing stations, I would like to request that noise readings be taken at Weybosset St/Fore River Ave in Weymouth, Rosalind Rd/Evans St in Weymouth and at 70 Pearl St – Johnson School – which is the public preschool in Weymouth that services over 300 preschoolers in Weymouth and is less than 4,000 feet from the proposed gas compressor station. I would also like to request these 3 points in Weymouth be added to the air quality studies for the Environmental Impact Statement in addition to the areas closer to the proposed site – which will most likely be Bridge St. King’s Cove Beach Rd in Weymouth. I’m sure Dee Rd. in Quincy will be analyzed and is about 1/2 mile away from the proposed site- but that road sits right next to Twin Rivers which is a fatty acids plant and produces skewed results for noise and air quality versus points on the half mile radius of residential Weymouth. Another concern I have is in relation to the minutes of the May 19, 2015 teleconference between FERC and numerous agencies. These minutes were published to the FERC eLibrary on May 29, 2015. The minutes state that FERC conducted field visits of the proposed gas compressor station in Weymouth and other sites along this project. The comments FERC made to Algonquin/Spectra during the site reviews are included with the minutes – yet there are no comments that pertain to the Weymouth site attached. It only includes detailed comments about the sites of other upgrades of the Atlantic Bridge Project in CT and NY. 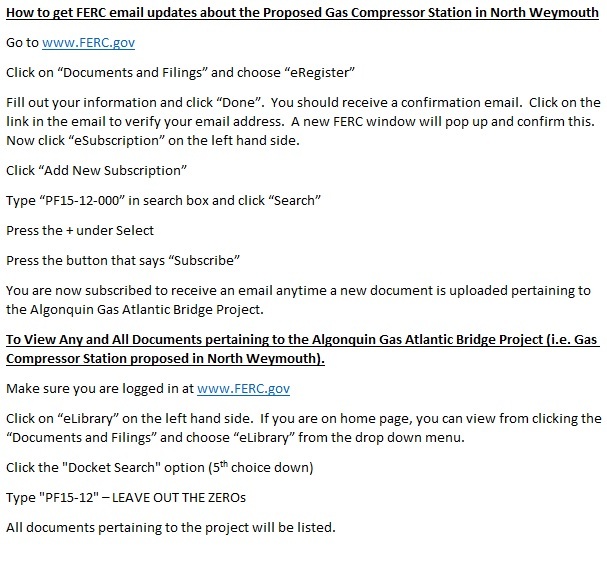 Can FERC please publish the comments made about their site visit to the proposed Weymouth Compressor Station site or publically state that they have no comments or concerns about the proposed site so the public can view these? Another concern I have is on the Staff Comments to the Draft Resource Reports 1 & 10 that was published on May 20, 2015 and I pasted below for your reference. Please note that the $244 million bridge that is currently under construction directly adjacent to the proposed compressor station site is called the “Fore River Bridge” and not the “Washington Street Bridge”. I have concerns that if other agencies are weighing in on their thoughts about this proposed site they will not know or understand what high cost bridge the project is referring to. Additionally, construction of this bridge has been delayed 6-9 months which would push the completion date from November 2016 to anywhere from May 2016-July 2016 which is approximately the time Spectra wishes to construct this compressor station. I hope MassDOT has been given the opportunity to address their construction needs with Spectra and how the two projects will work concurrently together should Spectra not seek a much needed alternate site. Thank you for your consideration in addressing these additional concerns. DRAFT Resource Report 1 & 10 – Issued March 23, 2015. Original document over 250 pages, this is 8 page condensed version. 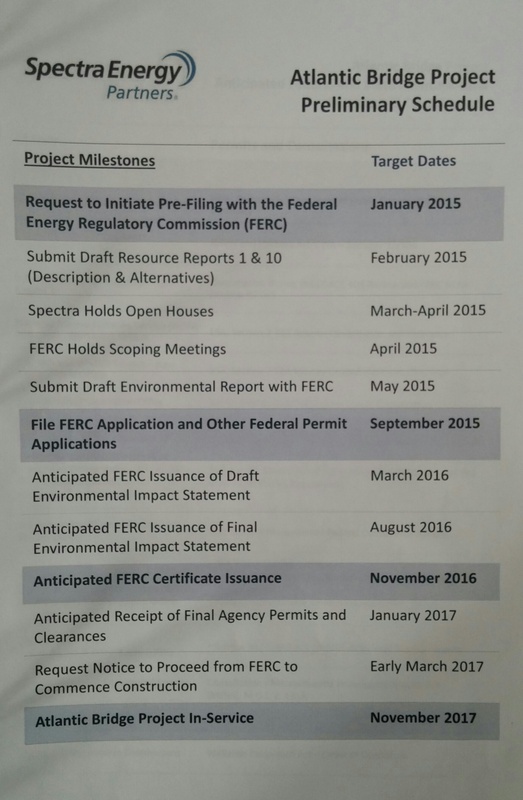 FERC-Spectra Telephone Meeting Minutes of 5-19-15 – Telephone Meeting Minutes from May 19, 2015, issued on FERC’s website on May 29, 2015. FERC’s Comments on DRAFT Resource Report 1 & 10 – Issued May 20, 2015 asking Spectra for more information. 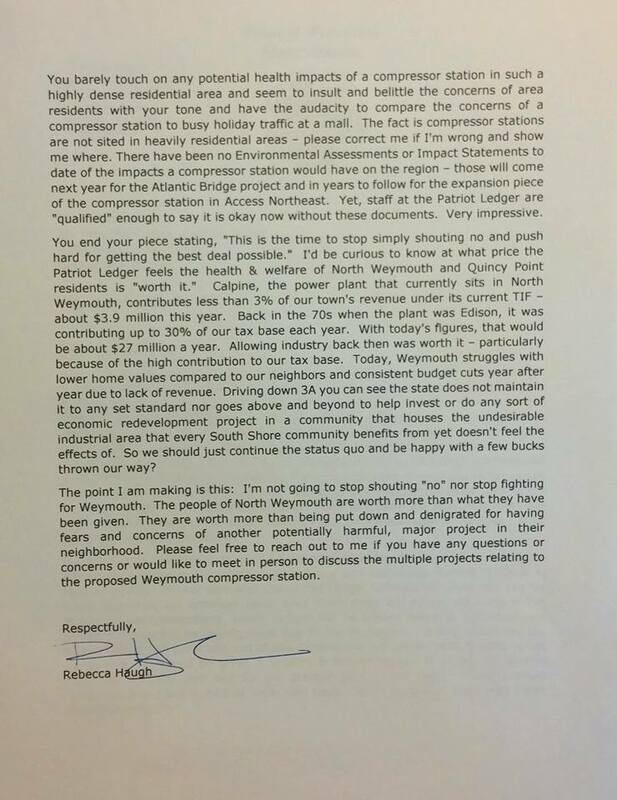 5/27/2015 – Below are my public comments from the May 27, 2015 MA Energy Facilities Siting Board meeting held at Abigail Adams Middle School in Weymouth, MA. “My name is Becky Haugh and I’m the District 1 Town Councilor in the Town of Weymouth who represents North Weymouth which includes the area of the proposed gas compressor station. I’d like to thank the Massachusetts Energy Facilities Siting Board for hosting this public hearing to hear from the residents of Weymouth, Quincy & Braintree who will be affected by this station. I have multiple concerns about this compressor station being located at approximately 6 Bridge St. in Weymouth. For starters, We are currently in the middle of the Fore River Bridge Construction Project which sits just about 100 yards away from proposed site. This $244M bridge project, being funded by both federal and state monies is set to complete spring 2017. Workers have just finished the concrete approaches on the Weymouth side and I fear just the construction alone of a compressor station – or any building of that matter that close to this bridge will jeopardize the structural integrity which is suppose to last us for 75+ years. And for the price tax payers shelled out for it, it better last that long. Next to this proposed property, the Town of Weymouth was awarded a conservation restriction to the 2.9 acre King’s Cove parcel for public conservation and passive recreation through mitigation obligations under the Massachusetts Department of Environmental Protection Chapter 91 license for the power plant across the street. Chapter 91 regulations require that non water-dependent projects must provide greater benefits than detriments to the public’s rights in waterways. We fought as a town in the early 1990s for this benefit. We fought in the late 2000s with the Fore River Bridge project to get this area rehabilitated after bridge construction. A gas compressor at this site will render this conservation land useless because no one in their right mind will be taking leisurely walks next to this. It’s actually very peaceful there now – many here have met me at this site in recent weeks and can attest to that. Should an emergency arise at this proposed gas compressor station, we would have an extreme public crisis on our hands in Weymouth and Quincy no matter what the evacuation zone would be – the Fore River Bridge would be part of any evacuation plan which transports over 33,000 vehicles a day. For public reference, should an emergency arise, and the evacuation zone was 1 mile, the pinpoints for the residents reference would be St. Jerome’s Church on 3A, the Abigail Adams Birthplace on Norton St. and the intersection of Southern Artery and Washington St. in Quincy. 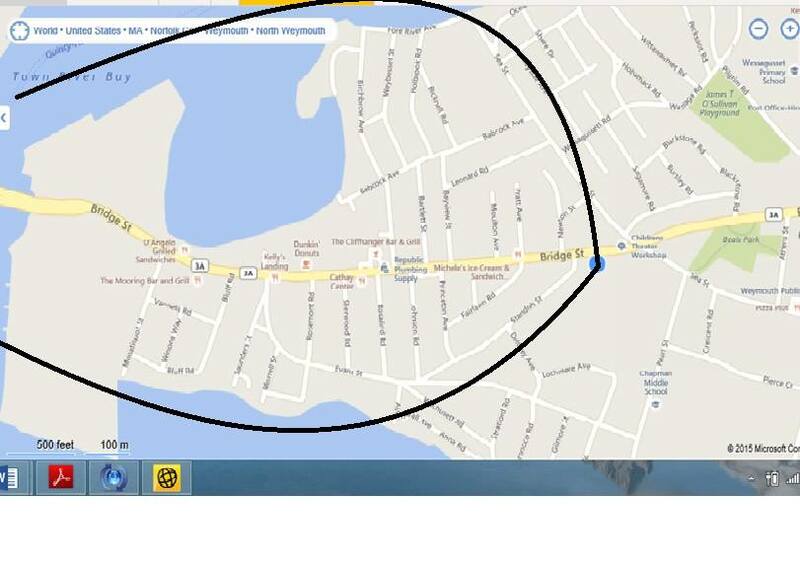 If the evacuation zone was 2 miles, that would be the Hingham Shipyard, Weymouth’s Town Hall and Quincy Center. We are talking about evacuating 10s of thousands people and shutting down the most traveled road in Weymouth should an emergency arise. In September 2007, Spectra proposed to build a gas compressor station on the Algonquin Line – it was a 150 acre parcel in Boxford MA – this location is 15 times the size of Weymouth’s proposed parcel. The population of Boxford is only 8,000 – compared to Weymouth’s 54,000. There were a couple dozen homes within the ½ mile radius in Boxford. We have almost 1000. February 2008, Spectra pulled their plans to build in Boxford due to what they said was “lack of financing”. Alternative sites at that time were also located in Danvers and Rehoboth. Both significantly less populated that Weymouth/Quincy and both offering much more open space. If Spectra now has the finances to build a compressor station – WHY NOT GO BACK TO THESE COMMUNITIES ON THE ALGONQUIN LINE? Having to evacuate 17, 26, 34 households within a half mile isn’t good for anyone – but it is a lot easier for a town to handle than 1,000+ households. Has anyone even asked the Mayor of Weymouth – or our police and fire chief whether they are capable of evacuating half of North Weymouth? Has the Mayor of Quincy been asked if he can evacuate Quincy Point and Germantown – both environmental justice designated communities due to their high minority/low income populations per the Massachusetts Executive Office of Energy and Environmental Affairs? Has anyone asked why such a highly populated area is being targeted for a compressor station when virtually all of them are built in rural, low populated areas where the impacts of such a station and potential risks are relatively small? Why is Weymouth, the South Shore and the Commonwealth of Massachusetts being set up by a company based out of Texas to be a science experiment for this? 5/15/2015 – If you were unable to attend Wednesday’s FERC Scoping meeting, I have attached my comments from that night for your reference below. 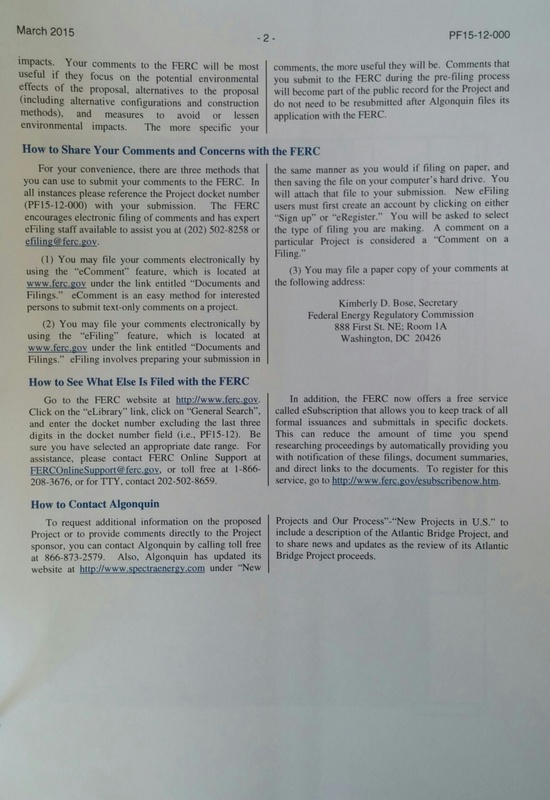 Please consider submitting written comments while the FERC public commenting period is open from now until June 11. It could be 1 sentence. It could be a max of 6000 characters. Input is needed. “My name is Becky Haugh and I’m the District 1 Town Councilor in the Town of Weymouth. I do not oppose the entire Atlantic Bridge Expansion project and recognize the need to increase the supply of gas in New England, however I oppose constructing a gas compressor station in North Weymouth and urge Spectra to seek an alternate site between here and Burrillville, Rhode Island – the next Compressor Station on this line. We are a densely populated residential area and already overburdened with a plethora of industry along the Fore River. I recently took a walking tour of the Oxford, CT compressor station and driving tours others on the line. I’ve done non-objective research on compressor stations including the 433 page Environmental Impact Statement of the Algonquin Incremental Market Project which includes updates to 6 existing compressor stations on this line as well as the pipeline expansion in West Roxbury. It boggles my mind that North Weymouth is proposed for this compressor station as it does not fit the mold of existing compressor station communities. I would like to request a full, comprehensive environmental report on the true effects a compressor station would have on a region of this type. 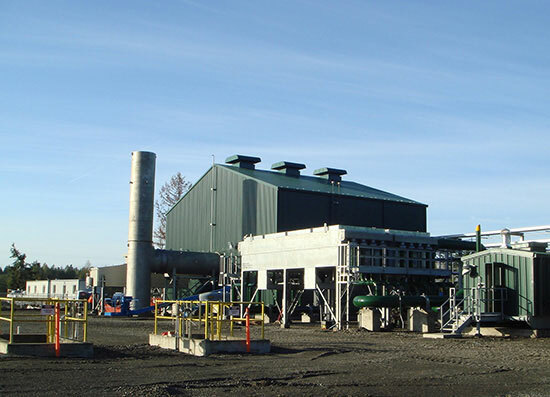 Compressor stations typically sit on 60, 70, 100+ acres of land. They have maybe a couple dozen households within the ½ mile shareholder radius. The proposed Weymouth site sits on only 10 acres of land and has almost 1,000 households within the ½ mile radius. Not only that but this ½ mile radius houses a power plant, fuel storage tanks, an oleochemical plant, a railroad, a sewer pumping station, a major state road that transports 33,000 vehicles a day as well as a ¼ billion dollar bridge currently being built – a far cry from the EIS descriptions of “densely wooded” “open space” and “rural area” of towns that currently host compressor stations. And to make matters worse, the neighborhoods of Quincy Point and Germantown in Quincy are within the ½ mile radius of this proposed site. Both of these neighborhoods are recognized as Environmental Justice neighborhoods by the Massachusetts Executive Office of Energy and Environmental Affairs for having a high minority and/or low-income population. President Clinton signed his Environmental Justice executive order in 1993 to protect these citizens from being overburdened with potential environmental hazards and this proposed compressor site location is a blatant disregard to that order. It will be stated that this compressor station will be low-odor and within legal decibel levels for noise. Which is fine on paper – but come out to the proposed site. Those numbers do not take into consideration the constant breeze down there that blows certain smells all over the neighborhood. Those numbers do not take into consideration the way the sound echoes off the water or all of the current structures down there – those numbers only work when you’re out in the middle of no where and your only abutters are trees. Numbers and statistics do not have take into consideration the environmental impacts that North Weymouth has. 5/14/2015 – We had a great turnout at the FERC Scoping meeting on 5/13/2015 with more than 200 people in attendance and over 60 speakers. Read thePatriot Ledger article here and Weymouth News article here. We have two important key items going on now. 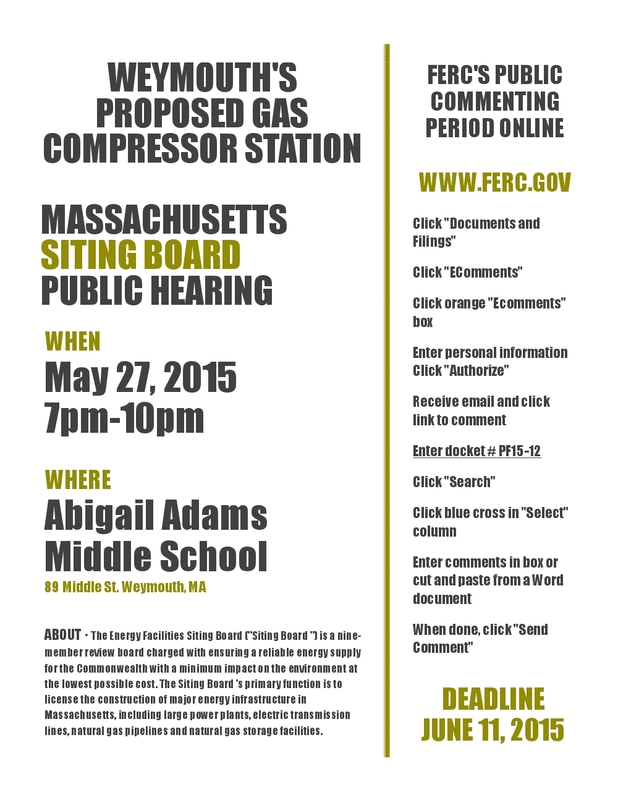 The FERC online commenting period which is open now until June 11, 2015 and the MA Siting Board Public Hearing on May 27, 2015. Click This LINK —- FERC Flyer —- For a higher quality, printable version of the above flyer about the May 27th meeting and directions on how to submit comments on FERC’s website. 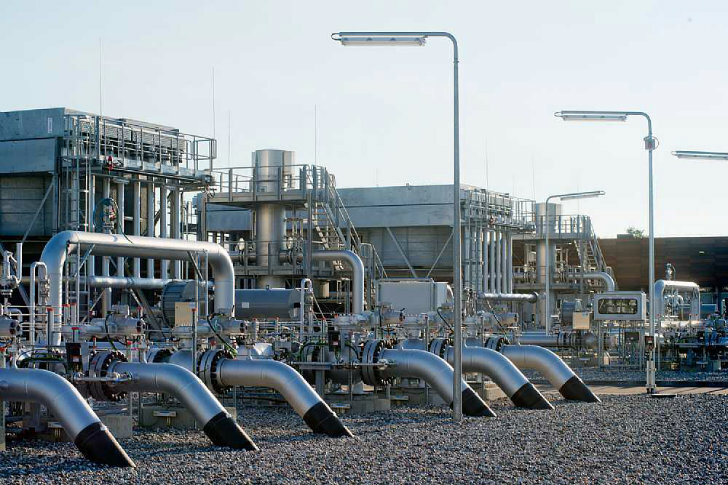 5/6/2015 – What does a Gas Compressor Station look like? As of now, there are no formal or finalized plans for the proposed North Weymouth gas compressor station. Most of the pictures you may have seen at the Open Houses were that of the compressor station in Oxford, CT. Gas Compressors have no specific mold – they all vary in size, color, aesthetics, etc. 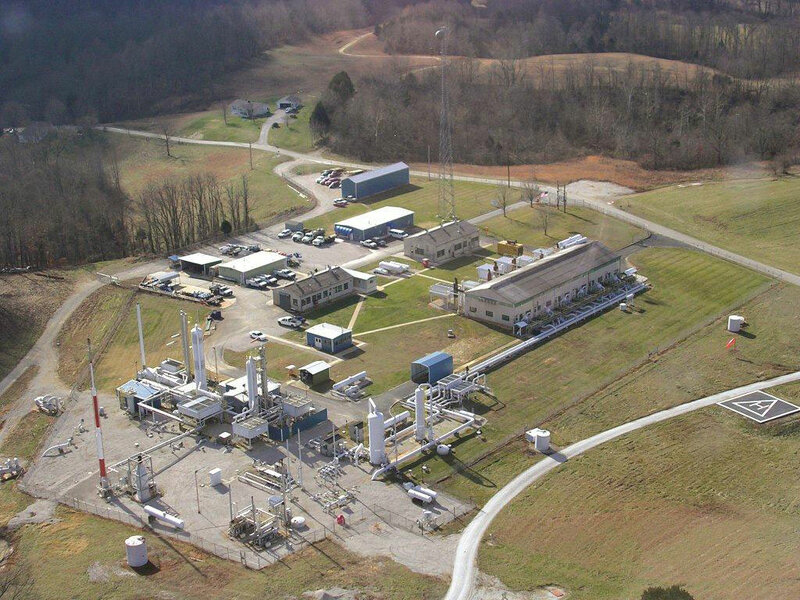 I have created THIS PHOTO ALBUM of various compressor stations around the country. Please take a look at what they look like in other communities. Thank you. As of 5/5/2015: The FERC Meeting is one week away. I have set up three times for residents to come out and meet me at the proposed site to get a feel of where it is and to ask any questions or state any concerns they have about the project prior to this meeting. The meetings will take place at the public park adjacent to the proposed site at 6 Bridge St. (use this address if you’re using a GPS to get there – there is parking lot you can use that will not interfere with bridge construction). 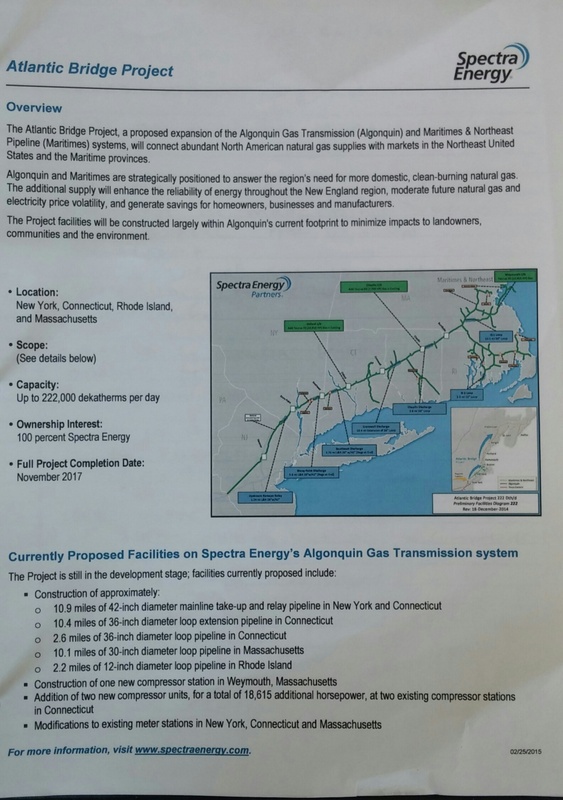 In December 2014, Weymouth was notified that Algonquin Gas Transmission, a division of Spectra Energy was considering a parcel of land in North Weymouth as a proposed site for a new gas compressor station on the Algonquin line. 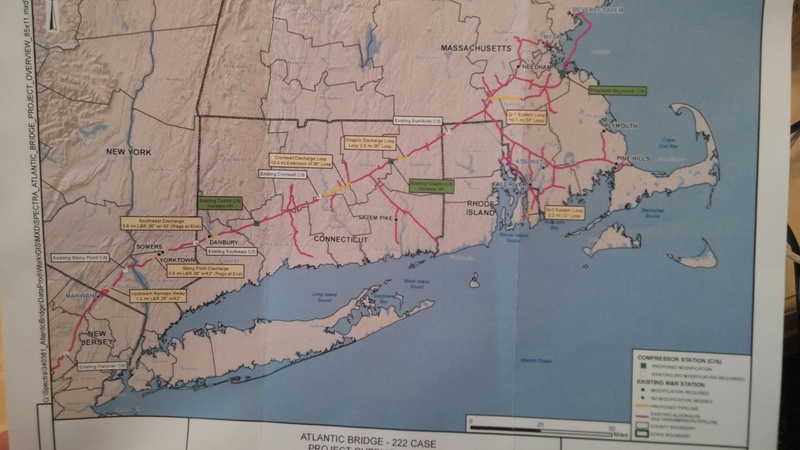 This is one aspect of a multi-state expansion project called “Atlantic Bridge Project” proposed by Spectra. As of April 2015, Spectra has hosted two Open Houses in Weymouth – one on January 29, 2015 and another on March 19, 2015. Both were held at the Weymouth Elks. Other open houses were held in various cities and towns along the expansion project. Spectra Energy submitted their pre-filing application on January 30, 2015 and FERC approved this on February 20, 2015. Docket Number FP15-12-000 was assigned. This is just an approval to move forward with the process – not a final approval of the entire project. As the process moves forward, I will add any information to the top of this post/page. For the time being, you can sign up for updates with FERC. Since the process of signing up is semi-confusing and difficult – if you are not used to the FERC website, I have prepared instructions specific for this project. I also put a PDF version (link) if you wish to view, save or print it that way. Current Design Plans for the proposed North Weymouth Compressor Station.